View More In Technical Drawing Supplies. 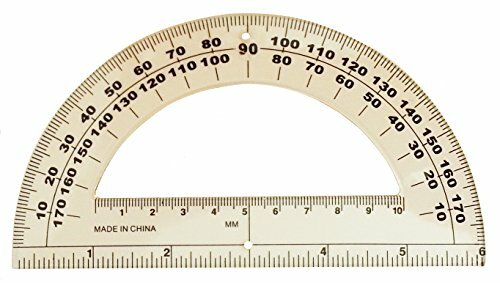 These 180 degree clear plastic protractors have both a 6 inch ruler edge and a 10 cm ruler on the open center. Pencil holes are located at the 90 degree mark and 3 inch ruler mark. The black markings clearly define the 1 degree increments making it easy to read. Plotting 0 to 180 degrees can be done left to right and right to left. Great for art or geometry class and home crafts. Pack of 50. If you have any questions about this product by OnlineScienceMall, contact us by completing and submitting the form below. If you are looking for a specif part number, please include it with your message.